The Ontario Student Assistance Program (OSAP) is currently undergoing a number of changes aimed at increasing transparency and access for students. In the first phase of its transformation, OSAP bundled existing grants into a single Ontario Student Grant, making tuition effectively free for eligible low-income students. Phase two (2018-2019) will roll out net-tuition billing, whereby students will see only the net cost of what they will be paying to their institutions, after financial aid has been subtracted from tuition. For more information on net billing, see here. Amidst these changes, HEQCO wondered how much college and university students currently understand about the way that they access student financial aid through OSAP. We asked Academica Group to survey college and university students about their perceptions and knowledge of OSAP. Some common misconceptions and often confused aspects of the program are illustrated below. Red denotes areas of confusion. Blue denotes the correct answer. In particular, about a third of both college and university students either didn’t know about the repayment plan for OSAP or thought it didn’t apply to them. Students are overwhelmingly confused about the grace period, which refers to the six-month period immediately after graduation when students are not required to make payments on their loans, and not whether interest starts to accrue during that time. Upon further probing, we found that only 16% of students knew that interest on the federal portion of loans starts accumulating immediately after graduation. 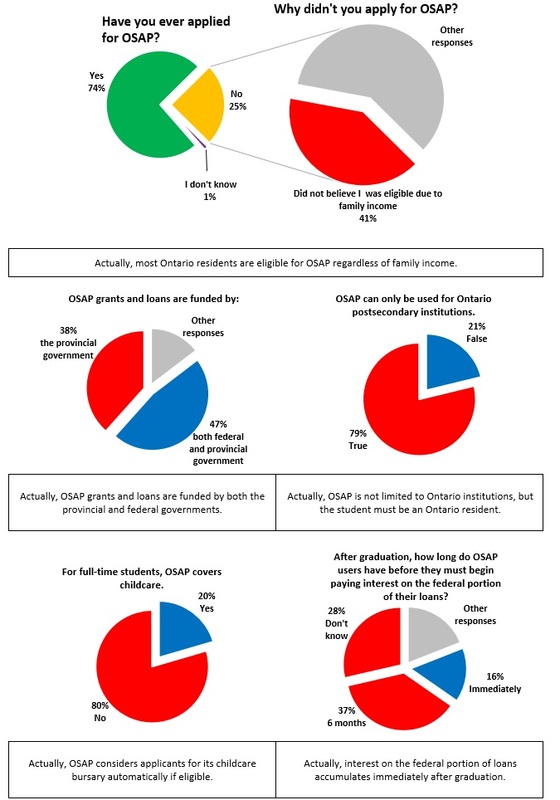 Clearly, there are aspects of OSAP about which students continue to misunderstand. With the bold new changes rolling out this and the next school year, we at HEQCO are eager to see how these changes will affect students’ perceptions and understanding of the program. Cassandra Cao is a senior researcher at HEQCO. Jikai Long provided assistance with data and graphs.